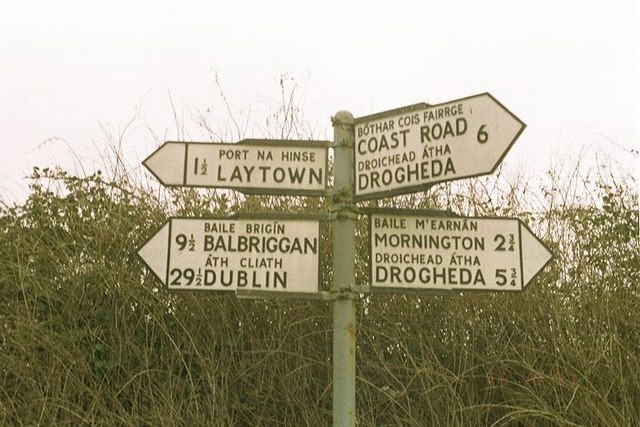 This rustic Irish sign (black letters on a white background) provided distances in Imperial Miles, before the signage was replaced with green background signs that featured distances in kilometres. This sign, (no longer in place due to metrication) at the junction of the coast road at Bettystown tells travellers that Drogheda, the nearest town, is 6 miles away, but you can save 1 quarter-mile by avoiding the coast road and heading inland. © Copyright Raymond Okonski and licensed for reuse under this Creative Commons Licence. This page has been viewed about 453 times.